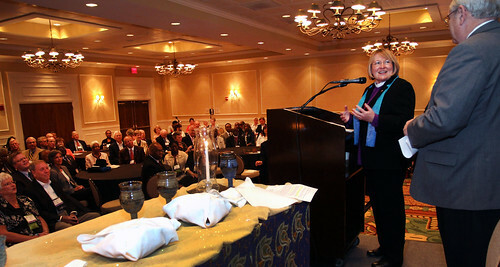 United Methodist Bishop Rosemarie Wenner of the Germany Area prepares to receive the gavel from Bishop Larry M. Goodpaster of the Charlotte (N.C.) Area in a "passing of the gavel" ceremony and celebration with United Methodist bishops on April 26 at the Embassy Suites in Tampa, Fla. The bishops blessed Wenner, worshipped and celebrated Communion together and gave their congratulations. Wenner is the new president of the Council of Bishops. A UMNS photo by Kathleen Barry. While delegates to the 2012 General Conference in Tampa, Fla. were engaged in legislative discussions on the future of The United Methodist Church, members of the Council of Bishops reflected on their impact within the denomination and celebrated the new leadership and ministry opportunities that will arise in the next quadrennium. In an intimate mid-morning service in the presence of fellow bishops, family and friends, Bishop Larry M. Goodpaster of the Western North Carolina Annual (regional) Conference passed the gavel to Bishop Rosemarie Wenner of Germany. The gavel represents the work of stonemasons who fashion pieces together. Comprised of the active and retired bishops, the council operates under the leadership of a president elected from their ranks to serve as an executive officer. In the past the president was elected for a one-year term from each of the U.S. jurisdictions and a central conference on a rotating basis. In 2004, the council shifted the term of council president from one year to two years. Since the demands of serving both a regional conference and the general church increased, the council asked General Conference to begin the process of amending the constitution to permit them to elect a president without residential responsibility. After a reading from 2 Corinthians 4:7, 5:16-27, Bishop Goodpaster reflected on Jesus' clarion call for his followers to be witness to all the ends of the earth. "The Council of Bishops is one of God's signs to the world" that The United Methodist Church takes this holy call to ministry seriously. Members gathered around Bishop Wenner, laying hands on her and singing "The Servant Song" to support her new role as president. Goodpaster expressed appreciation to retired Bishop Neil Irons, the executive secretary of the council, and JoAnn McClain, administrative assistant to the council. Goodpaster stressed that the council "has tremendously influenced the church in ways the church may not be aware of," particularly as it relates to the four areas of focus, reforming the Council of Bishops and reforming the church. After receiving the gavel, Bishop Rosemarie Wenner expressed her thanks to Goodpaster and shared the challenges and joys of taking on this new leadership role: "Things look differently depending on the perspective you are looking on it." Wenner jokingly added that before this moment, she knew Goodpaster was in charge but now things have changed. To help illustrate the changing perspectives, Bishop Wenner showed a black-and-white image and asked those gathered if they saw two faces or a chalice. "There are different things to see in the same image at the very same moment." Referencing The Walk to Emmaus in Luke 24:13-35, Bishop Wenner suggested that the disciples did not recognize the risen Christ walking with them because they were still dealing with his crucifixion. Wenner offered a second image of a bronze relief made by German artist Klaus Ringwald that can be seen either as three men sharing a meal or the biblical story of the triune God in communion with us. Bishop Wenner presented the communion and hospitality embodied in the image as a representation of our ministry to the world. "Easter is happening in our daily life," declared Wenner. Challenging those in attendance to live the Easter story, Wenner cautioned that "Holy Conferencing could change into an unholy power battle" unless the bishops and others overcome the tendency to let frustration and resignation motivate our actions instead of using conferencing as a way to see everyone as people of God. Believing in the power of the Holy Spirit, Wenner acknowledged that no one should expect miracles from the new president but "don't hesitate to expect miracles from the risen Christ." As the disciples walked with Jesus on the road to Emmaus, likewise, John Welsey's heart was strangely warmed by his experience at Aldersgate. "I pray that we live as Easter people," expressed Bishop Wenner "with burning hearts we regain the first love for the risen Christ &ellipsis; to keep us on His way to hope and justice." Bishop Wenner is the first female president from the central conferences. Her two primary focus areas during her tenure will be mission moving beyond an inward focus and unity finding unity in our shared communion and Holy Spirit. *Whittaker is director of communications and new media at the United Methodist Board of Church Society. Nimmons is communications specialist for the Western North Carolina Annual (regional) Conference and a member of the United Methodist News Service team at General Conference.